Many potential new homebuyers find themselves unable to secure a loan, confined to a smaller home ? or at least to a smaller loan ? because they don’t understand the ins and outs of their credit score. First of all, your FICO (Fair Isaac Corporation) credit score does not tell you how much you can afford, how much you have saved for a downpayment, how well you budget or the balance of any of your bank accounts. What it does tell you (and your lender) is how you handled credit over time. Although the algorithm FICO uses to determine your score is a closely-guarded industry secret, the primary factors negatively affecting your credit score are late payments and your debt-to-credit ratio. You know what to do about late payments. Pay. On. Time. If you have late payments in your payment history, the best thing you can do about them is to not have any more late payments. The older the late payments are, the more your on-time payments can offset them. 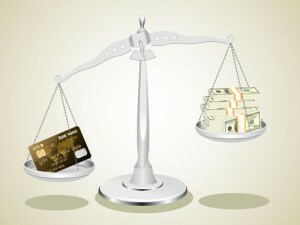 Your debt-to-credit ratio is entirely different. You are in control of this aspect of your credit score, so you need to know what it’s all about. On your credit report you’ll see a category called “amounts owed” that, rather than actually reflecting the amount of money you owe, speaks to the relationship between how much you owe to the total of your available credit. That is, the credit limit of your credit cards. Also called your credit utilization, your debt-to-credit ratio can raise or lower your FICO credit score. That means that — all other things being equal — while both you and your twin brother may OWE $2000 on credit cards, your brother’s credit score could be lower or higher than yours based on the ratio between what you owe and the amount you have available. Say you have a credit card with $5000 available credit and you owe $2000 on that card. You are using two-fifths of the available credit or a .40 ratio (40% utilization). Your twin has a card with $3500 available credit. He also owes $2000. He has utilized four-sevenths or .57 ration (57% utilization) so his credit score will be lower than yours even though you both owe $2000. The higher the ratio of utilization, the greater the possibility of a red flag on your credit report that you may be overextended financially. Although your twin may well be able to afford the payments he has, should an emergency occur, he do not have as much margin available and could slip into difficulty in meeting financial obligations. the relationship of how much you currently owe to the original amount. Most financial planners suggest keeping your utilization no higher than 30% at any given time among all your credit accounts. Do not close old accounts. When you’re trying to reduce your debt-to-credit ratio, you may be tempted to close old accounts that you have paid down to zero. If you do, however, that credit is no longer counted in the “available” category. In the scenario above, say that the $2000 you owe is spread between two credit cards: card one with a limit of $1000 at 100% utilization ($1000) and one with a limit of $4000 at 25% utilization ($1000). If you paid off the $1000 limit card brining that credit card to zero, but leaving it open, would give you a credit ratio of .20 (or 20%). If you close the account, your available credit drops to $4000 so your utilization bumps up to 25% or a debt-to-credit ratio of .25. When you are seeking a mortgage, do more than just pay the minimums. Try to pay as much down on your credit accounts as possible, as soon as possible ahead of applying for a mortgage loan. It might seem logical to open more credit accounts to increase your available credit and lower the ratio, but another factor in your FICO score is how recent new accounts are relative to your loan application. Since the exact impact this can have on your score is not available, err on the side of caution. If you have questions about how to improve your credit score, your real estate professional may be able to direct you to more resources. Next Next post: Spooky or Spectacular?